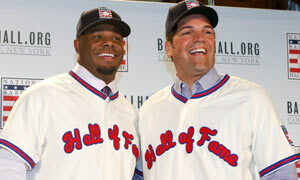 Ken Griffey Jr. and Mike Piazza have been elected to join Major League Basebell's Hall of Fame. Griffey Jr. will go in as a Seattle Mariner and Piazza, a New York Met. Griffey Jr. was named on 99% of the ballots and Piazza on 83%. In eight years for the Mets, Piazza batted .296 and hit 220 home runs. Griffey Jr. spent 13 of his 23 years in Seattle, where he hit 417 of his 630 homers (sixth all-time) and batted .292.